Submitted by Chris (not verified) on Tue, 2011-03-01 17:09. From the methodology section: "Totals include all contributions connected with each organization, including subsidiaries and affiliates. ... Contributions by individuals connected with the organization. This includes employees, officers, and members of their immediate families. " These are numbers that include personal donations made by employees. When it says "American Fedn of State, County & Municipal Employees", what it represents is the total contribution of all members of the union. I don't believe this is what nearly anyone is thinking when they say "corporate contributions". Even for Goldman Sachs, I think there is a huge difference between the employees contributions and direct funding from corporate accounts. Direct funding from corporate accounts is the problem with "Citizens United", see the Chamber of Commerce ad blitz in the last election. Furthermore, I think these numbers would look a lot different if we saw them "per capita", by dividing by the number of people associated with each of these organizations. A million teachers donating 20 dollars is not the same as an oil company funding a 20 million dollar ad campaign with shareholder money. Submitted by Joe R. on Wed, 2011-03-02 00:37. Yeah...this is a mostly libertarian forum. We're not just going to nod in agreement to a statement like that. What is the "problem" with freedom, and what things are worse than before, and how did the ad blitz directly cause them? Submitted by jaed (not verified) on Tue, 2011-04-05 07:39. Direct funding from corporate accounts is the problem with "Citizens United"
Citizens United has nothing to do with direct funding of campaigns - that was a first-amendment case, where the people running CU were threatened with imprisonment if they showed a movie that was critical of a politician running for office. Citizens United didn't alter the rules for contributions to parties or candidates, which is what the chart is about. Submitted by Anonymous (not verified) on Tue, 2011-04-05 07:44. Submitted by geokstr (not verified) on Tue, 2011-04-05 08:46. And a large minority of those million teachers don't vote Democratic and don't want their dues to support Democratic candidates at all. Submitted by Anonymous (not verified) on Tue, 2011-04-05 10:50. Then don't support with your dues. We ALL have a choice in this county, at least for the time being. If you want security through great pay and bene's then get a job that is NOT paid directly by tax payers and get brave and embrace competition! You, your children and the country will be better for it. If you want all these secuities with a teaching job, then DO NOT complain when tax payers complain about you and your unions actions and job performance. WE ARE your employer and have a right to a say over those! Submitted by ThatSameGuy (not verified) on Tue, 2011-04-05 11:37. I see this ridiculous argument all the time... I'm sorry, but your 5 grand in local taxes (if you're solidly upper-middle class) does not give you carte blanche to determine what public sector employees "deserve" or are "entitled" to make as compensation for their work. You are no more their "employer" as I am yours if I purchase goods from your company. How about a bit of perspective. Submitted by Squid (not verified) on Tue, 2011-04-05 13:11. You'll note that his argument said that taxpayers, collectively, have the right to set the wages they're willing to pay. I don't see how that could be construed as ridiculous, since it's the closest thing to the truth that I can think of. If the taxpayers don't have a say over public compensation, who does? Submitted by Nate Whilk (not verified) on Tue, 2011-04-05 15:05. You are the one who is ridiculous. The Constitution still begins with "We, the People". Politicians and government employees are still public servants. Servant, Master, not much diff. Submitted by I Got Bupkis (not verified) on Thu, 2011-04-07 01:17. Politicians and government employees are still public servants. Even FDR believed government unions were wrong. Who exactly, is the "oppressive boss" you're organizing against? The politicians -- who are completely, almost to a man, on your side? No, the poor schnook taxpayer who is getting screwed at every turn by having no representatives whatsoever at that bargaining table. Because the politicians sure aren't representing them. They stopped doing that decades ago. Submitted by richard40 (not verified) on Tue, 2011-04-05 14:38. In many states, if you want to be a teacher you have to pay union dues, whether you want to or not, since they are automatically deducted from your paycheck. Thus they dont really have a choice, unless they want to go into another occupation. Thus your "then dont do it" comment rings kind of hollow. That is the real battle in WI, where the main item the unions are fighting is Gov Walkers proposal to stop automatic deduction of union dues and make them optional for the public employees. This would allow them to not support the union if it opposes their views. If his proposal passes, then non-leftist teachers really would have the choice that you ask them to exercise. I support this reform in all states, and you should as well. Submitted by Steve (not verified) on Tue, 2011-04-05 09:45. "A million teachers donating 20 dollars .."
But a million teachers do not "donate" 20 dollars. A million teachers have money siphoned out of their paychecks and diverted to the Democratic party. Submitted by I Got Bupkis (not verified) on Thu, 2011-04-07 01:19. OK, so 990 thousand of them aren't democrats. LOL. Submitted by Constant_ (not verified) on Tue, 2011-03-01 19:18. To be fair, Jacob, you cut off the table at right about the point at which it ceases to be massively weighted toward the Democrats. And the table is seven times as long as what you show here. And while it is sorted according to amount given, the greatest amounts do not vary from the least amounts. Comparing the tenth place on the graph from the tenth place from the bottom, the tenth place has the amount $29 million, and the tenth from the bottom has the amount $7.7 million, which is a ratio of less than 4, whereas the graph is, as I said, 7 times as long as what you show, so there is (all told) a substantial amount of money on the part of the graph you don't show and which may well go a long way toward balancing the contributions. Nevertheless, the point remains that the absolutely largest donor whales are almost completely pro-Democrat, and this is a remarkable fact. Submitted by Jacob Lyles on Tue, 2011-03-01 20:17. That's a perfectly valid criticism, but I felt like the top 20 was a good place to stop for an excerpt. Submitted by Constant_ (not verified) on Tue, 2011-03-01 22:11. I'm glad you understood what I was saying, because re-reading it I said "graph" three times when I meant "table" and I said "do not vary" when I meant "do not vary all that much". I need to cut back on the glue sniffing. Submitted by Excel Wins (not verified) on Wed, 2011-04-06 18:02. I just copied the entire table into Excel and ran totals for each side (determine contributions per side based on total for a donator's donations and each respective percentage, then sum them up). Based on the donators in this table, Democrats received $1,293,080,241.20, Republicans received $858,606,177.44, and "others" received $28,463,124.36 during the '89-'10 period. 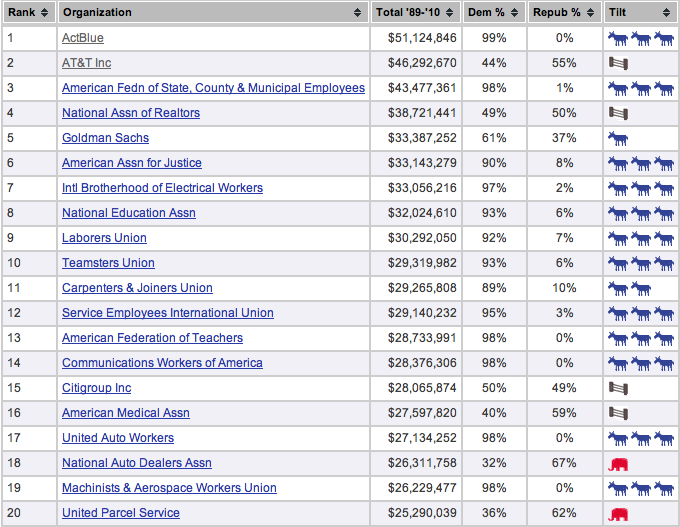 Even if Republicans appear to dominate the lower portion of the table, then assuming the figures in the table are true the Democrats still command the contributions of the companies and unions mentioned with about 50% more than Republicans received. Submitted by billwald on Tue, 2011-03-29 16:58. Just like businesses, we supported the politicians who voted for our bills. That's the American System. An honest politician - when you buy him, he stays bought. Submitted by FrancisChalk (not verified) on Tue, 2011-04-05 07:25. This table shows that, contrary to the accepted MSM meme, the Democrat Party is the party of lobbyists and special interests. Thus, you have been kept in the dark about this fact. If the story doesn't support the advancement of worldwide socialism, i.e the left/liberals and all their "causes," then it is simply not reported. Surely, all critical thinking people know this by now. Submitted by Anonymous (not verified) on Tue, 2011-04-05 07:38. It's straightforward to add up the donations from the lost of 140. In other words, Democrats received 151% of the donations that Republicans did. Submitted by sbwhite (not verified) on Tue, 2011-04-05 07:49. I dropped the whole list into excel, all 140 entities on the OpenSecrets list. Breaking it all down, how much money was given to each party, it comes to 59% Democrats, 39% Republicans. So the overall conclusion is true, that Democrats are getting more money from powerful lobbyists then republicans. Submitted by Polybius (not verified) on Tue, 2011-04-05 08:39. It is interesting to note who got screwed the worst when Obama took power. He just flat closed down thousands of auto dealers. It just goes to show that you have to send money to the Dems if you don't want everything you have built destroyed. Submitted by Deoxy (not verified) on Tue, 2011-04-05 09:01. Something which has been common knowledge to those who ask for quite some time... which is to say, almost no one knows, because so few people question the "facts" fed to them by the media. Nice to see another group of people buck that tradition. Welcome to reality. Submitted by Cousin Dave (not verified) on Tue, 2011-04-05 09:31. Submitted by Steve Maurer (not verified) on Tue, 2011-04-05 10:57. Setting aside the bias of the markings(*), what strikes me about all of this is the sheer paltriness of these numbers. Over ten years, the grand total of political spending by named organizations in this country barely breaks over 2 billion dollars. Compare this to what the U.S. spends on pet food, 39 billion dollars in 2006 alone. No wonder such small sums of money are so effective at instilling corporate welfare - there's so little of it. (*) These numbers have been clearly massaged to try to make things look "bad" foe the Democrats. 1] The markings are biased - an 11 point preference by AT&T towards the GOP, a 19 point preference by the AMA towards the GOP - are both marked as "balanced" for example. 2] Miscategorization - ActBlue is not "special interest group", they're just a conduit for individual donations made online. 3] The schema appears to equate union affiliation rather than employment status - so a union janitor who works for AT&T is counted as having donated as part of the union, rather than AT&T, 4] Far more importantly, it also counts employment status as being part of a group but not investment status - so an investor who has substantial investments in defense contractors and donates millions of dollars to Republicans is not counted as having made a donation on behalf of the company (when protecting his investments is clearly his intent), whereas some middle class worker who donates $100, is rolled up into the union donations. You can tell just how much "creative accounting" was used to make this chart, because it says there is a 2 to 1 fund raising advantage for the Democrats over the GOP, which is nearly the opposite of the truth. But even so, my original point stands. Even if you adjust this chart to reflect the actual truth, doubling or tripling money sent to the GOP, you still end up with not much money at all. Submitted by Aaron (not verified) on Tue, 2011-04-05 11:15. I went to the actual source page and ran the numbers for all of the top 140 companies. The split comes down to about 55/45 Dem/Rep, about $1.29 billion Dem and $.86 Billion Rep. This means there, at least theoretically, shouldn't be a bias one way or the other if one were to make the assumption that incumbents get more/less support. Personally, I'm of the opinion that treating a union like a corporation is a terrible practice. The structure of the two are entirely dissimilar. I'd rather see one list of corporations/business, and one list of unions/individuals. Submitted by CommonSense (not verified) on Tue, 2011-04-05 12:02. Presidential elections are the big money makers. Over the last 20 years, there have been 3 Dem POTUS terms and 2 Rep POTUS terms. That'd be 60%/40% Dem:Rep. And from what others have reported, they are finding an approximate 60%/40% split in the list of donations. This is expected. This is not news. Submitted by Anonymous (not verified) on Tue, 2011-04-05 12:14. Where are the individual donors? I'd like to see a list of the largest individual donors as well. Submitted by Libertarian (not verified) on Tue, 2011-04-05 20:32. If this is a libertarian forum, why are you nosing around in business other than your own? Hands off, I say. Mind your own business. Submitted by Dman (not verified) on Wed, 2011-04-06 04:16. Are the dollars adjusted to be constant per election cycle? Because otherwise the recent elections will dominate. The Democrats outspent the Republicans in the last presidential cycle, but I think that was unusual. In raw (unadjusted) dollar amounts the recent elections will dominate the earlier ones. Looking at the source, under "Methodology" it doesn't appear that inflation, and in particular the overall increase in campaign spending, has been taken into account.